500 – What’s the Big Deal? 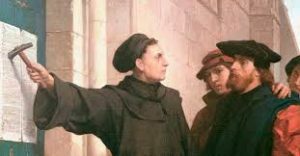 October 31, 2017 marks the 500th anniversary of the Protestant Reformation. The Reformation poster I grew up with pictured Martin Luther nailing 95 theses to the Wittenberg Castle Church door. The sound of the hammer hitting those nails spread throughout Europe. We know Martin was the son of a copper miner who became very successful in the business. Martin went to law school. Some legend creeps in at this point. He was riding back to school from visiting his parents when he was caught in a thunder storm, thrown to the ground and cried out that he would become a monk if he survived. The storm part of the story is shaky at best. Luther leaving law school and becoming an Augustinian monk is true. The 95 thesis? Probably never nailed to a door, but rather sent in a letter. Martin wrote to a close friend he never intended these to be published. What is true is Martin Luther unleashed a dialogue about God’s grace, church corruption and a Papal fund raiser gone very badly. Martin Luther and other reformers of the time were not subscribing to buying your way to heaven with indulgences and believed all people had a direct line to God and salvation by grace through faith. The Reformation gave birth to new expressions of the Christian faith. They looked different, but with the saving grace of Jesus Christ being central. Today the traditions are distinctive and subtle. Communion with wine or grape juice. Baptism by dabbing or dunking. Praying with hands raised or folded. Psalms chanted or spoken. Worship in ornate sanctuaries with Bible story windows or simple worship spaces with heritage or clear windows. Music led with guitar or praise band or piano or organ. Favorite hymn A Mighty Fortress or The Shining Shore. The richness of diversity should not serve to divide, but rather celebrate how God’s gift of grace is lifted up in relevant languages and practices to the people. What’s the big deal? Denominations from Roman Catholics to the Reformed are celebrating our Christian faith as followers of Jesus and not carrying our denominational IDs. “For as the body is one and has many members, but all the members of that one body, being many, are one body, so also is Christ.” (1 Corinthians 12:12) The focus today is moving beyond conflict and toward communion. This prayer was presented to me when I was called in 2001 to lead a disaster response agency at Ground Zero. It has significance in my life every day and is a reminder of God’s never ending presence. Pray this for our future together as followers of Jesus. God’s grace is the big deal. Posted in: Christian Life, Christian Spiritual Development, Plymouth ChurchLeave a comment on 500 – What’s the Big Deal? Last Sunday our youth group learned about hunger and food insecurity. We played games and ate a meal that taught us about hunger and clean water issues around the world. My favorite part of the evening was when a spontaneous discussion occurred in the middle of our games. We all sat down on the gym floor and talked about our experience serving those who are hungry and food insecure in our city. Many youth shared their personal stories of helping people through Brooklyn Delivers, the Plymouth Shelter, and food drives at their schools. One particular story has been circling my thoughts since the youth met. A middle schooler talked about the time she saw a homeless man on the street asking people for money. She had some food with her, and generously gave her meal to this man. He accepted the gift. After walking halfway down the block, she turned back to look at him, only to see that he was throwing away the food she gave him. “What am I supposed to do?” she asked the group. This teenager’s story has me wondering if Jesus ever had someone snub his gifts of kindness. Was there anyone in the crowd of the 5000 who turned their nose up to the fish and bread he supplied? Did a wedding guest complain that the water-turned-wine had too many tannins? Did the owner of the herd of pigs file a lawsuit against Jesus, claiming coerced porcine suicide? The stories don’t tell us. But I’m sure not everyone thought Jesus’ miracles were all that great. I’d like to think that my own generosity doesn’t hinge upon recognition or reward, but if I am honest, I really want people to view me as a charitable person. I enjoy receiving “thank-yous” and “good jobs.” But Jesus didn’t love others for his own reward. He loved others because he wanted people to know about God’s love. When Jesus fed, healed and welcomed others, he did so without expectation to receive anything in return. Jesus’ ministry was not for his own sake, but for Love’s sake. Sometimes our acts of service are met with rejection. Sometimes we don’t receive a thank-you note. And sometimes our well-intended gifts are not the most helpful in meeting someone else’s needs in the first place. I am glad that I have teenagers and youth leaders in my life to remind me that our attempts to love our neighbors isn’t about earning heavenly brownie points or boosting our self-esteem. It’s about offering another human a small glimpse of the Holy God, however dim a reflection it might be. Many of us are exhausted, sad, and angry. We need strength. We need hope. We need God. When the world is hard, we have to look harder. We are detectives searching for clues. Hope does not shout, but if we listen carefully we hear whispers. Hopeful things are happening, but we have to pay attention. This week, a child in California gave a firefighter a hug. A congressperson had second thoughts about assault rifles. A relief worker in Puerto Rico handed a bottle of water to someone who was thirsty. He did not throw paper towels. A diplomat from North Korea and a diplomat from the United States shared a pizza. A 60-year-old ordered his morning coffee in Spanish for the first time. A white NFL player asked an African American player why he was kneeling during the anthem, and listened to his response. A black judge acquitted a white racist of a false murder charge. A white police officer asked a black teenager how the police could be more helpful. A Christian minister invited an imam to talk to her church’s youth group. A senior citizen who has never been to a protest marched in support of immigrants. An office manager sent a memo to the CEO pointing out that women are still paid less. A father who thinks of himself as old school told his gay son how proud he is. A homeless veteran went to Plymouth Church for dinner and a good night’s sleep. A shopper at a car dealership decided to buy a hybrid. A neighbor talked to an elderly woman sitting on her stoop. A sophomore changed his major to social work. An angry man started to make an angry phone call, but then hung up. A book group picked Frederick Buechner for their next book. A fan at a Bruce Springsteen concert believed again. A bald man decided that hair is overrated. A mother gave in and got her eight-year-old a puppy. A couple going through a divorce decided to put the children first. An architect received a text from an old friend inviting her to lunch. A cabdriver picked up a fare in a wheelchair and took her to Key Food for free. A doctor told an artist that she is going to have a girl. A retired teacher laughed out loud for the first time since his wife’s death. The world’s problems are devastating, so we keep looking for hope. We do not need to pretend everything is okay. We need to pay attention to the hope that surrounds us. Years ago a Sunday school student asked me for examples of modern day miracles. It was before Google. I was stumped, but managed to remember a few medical miracles I’d heard and read about. The student was clearly not satisfied with my answer. When I asked him what he thought, he quickly responded, “My mother says children are a miracle.” I wondered if she hadn’t been talking about the miracle of childbirth, but let it go. These times beg for a miracle. Good news has been sparse as one disaster follows another. It’s hard to keep up with the hurricanes, floods and fires; earthquakes no longer make the front pages. The death toll of a mass shooting is as unnerving as the looming threats of war. It’s hard not to feel guilty when reading the headlines, when looking at the pictures of people suffering on the front pages. It’s hard not to feel distraught, overwhelmed and helpless only to feel guilty again when we’re not directly impacted. Around three o’clock, the local schools get out. Daily now, I find myself opening my office window a bit more to soak in the laughter, the audible excitement of catching up with friends, heading to the playground, a favorite after school activity or soccer game. Yesterday it struck me that I not only know some of these children, but that they were in Sunday School with me this past week as we tackled some tough subjects. I remember the girl who observed that with each disaster, we seem to forget the victims of the last disaster still struggling to recover. I recall the concern for the helpless animals in the voice of one child and the heartfelt confusion of another who asked what we are all wondering, why do bad things happen? Then I think of the boy who approached his principal to start a drive to benefit the victims of Hurricane Maria. The girl whose science club is holding bake sales to raise money for climate change awareness. The girl’s friend who wants to learn how to build houses for those who lost theirs and the boy who now wants to become a traveling doctor. And that’s when I feel some glimmer of hope, that’s when I’m reminded that God speaks to us through others and that’s when I realize that Gabo was correct. Children are miracles, each and every one. We need to listen to them. I grew up going to church three times a week, but I was in college before I heard anyone say that Christians have a responsibility to feed the hungry. What could be more obvious? If someone you love was starving, you would do everything you could to save his or her life. The gospel Jesus taught makes it clear that someone God loves is starving. What do we look like from God’s perspective? Imagine that you have two children. One child is trapped in a country where hard-working people are starving. The second is in a wealthy country and has more than enough. What would you think if the second child did not try to save his or her sibling? Would you wonder if the child who does not give is a real Christian? How is this different from how God views us? At the close of worship this Sunday we will give an offering to feed the hungry in Cameroon through the Mission School of Hope. (Click here to see how our gifts will be shared.) In general, our responses will fall into three categories. The statistics on hunger are overwhelming. 800 million people around the world are hungry. Every 4 seconds someone dies from hunger. About 24,000 people die every day from hunger-related causes. Most of the victims are children. The statistics are so overwhelming that it is possible to forget that our offering will make a real difference for real children in Cameroon. The Talmud says: Do not be daunted by the enormity of the world’s grief. Do justly, now. Love mercy, now. Walk humbly, now. You are not obligated to complete the work, but neither are you free to abandon it. On Sunday, you and I have the opportunity to do the right thing. Here are the details on how you can make a difference.